ONE of the most popular, and the most unusual waterway events of the year is undoubtedly when Stoke Bruerne goes to war. 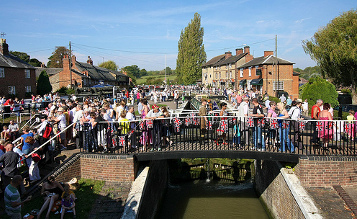 For the 11th year in succession the canalside village of Stoke Bruerne is all set to go back in time to the days of the Second World War. This popular re-enactment weekend has increased in size and popularity year on year, probably due to its unique atmosphere which sees living history groups and individual re-enactors combining with historic working boats to tell the story of what life was like in wartime Britain. 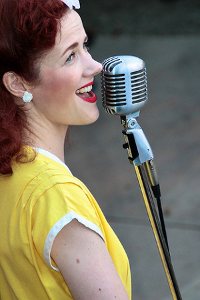 Forties tribute artistes, singer Lola Lamour (pictured) and George Formby look-alike Paul Casper, will be joined by Perfect Vintage, Betty Bluebird, Ruzzit Buzzit, Sparky & Sprite and The Market Harborough Ukele Band to provide non-stop musical entertainment. 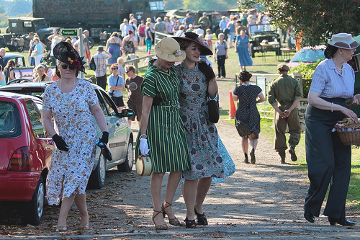 The village hall will be hosting a Tea Dance with full instruction in swing and jive for novices, the church will be hosting a fashion parade and the fields and open space around the village centre will be filled with vintage markets, memorabilia displays, military and vintage vehicles, and 40s dioramas. All of this presided over by the Prime Minister, the Rt Hon Winston Churchill and Field Marshal Montgomery with members of 40s living history groups and re-enactors from all over the country creating that authentic wartime experience. And of course, weather permitting, it is hoped to see a Spitfire and possibly other vintage aircraft from the Battle of Britain Memorial Flight in the skies overhead. As well as the museum’s own historic working boat Sculptor, which was seconded to the Auxillary Fire Service in London as a fire boat during the war, there will be an assortment of working boats moored along the canal with a representative of the Ministry of War on hand to ensure that traffic is kept moving and that boatmen do not spend valuable working time in the licenced premises beside the canal. On the Friday night for those arriving early, there will be a forties sing-song, and on Saturday evening for those staying on site, a swing dance at the village hall.